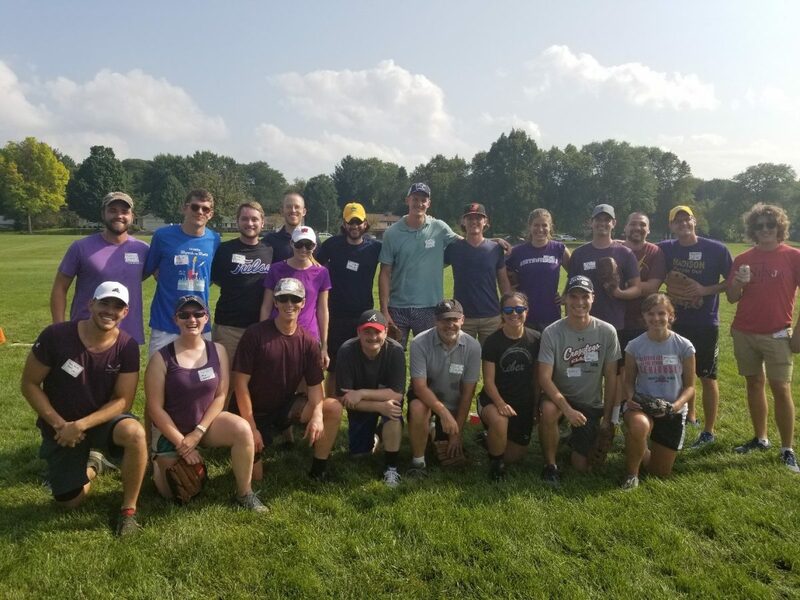 September 25, 2018, Madison, WI – The Graduate Student-Faulty Liaison Committee (GSFLC) celebrated its 35th annual Snout-Out departmental picnic and softball tournament. Named after the original tradition of cooking a pig underground, the Snout-Out brought together 15 faculty members, 150 graduate students and nine postdocs, as well as numerous friends and family. Xiao Dong, a third year in the Yoon Group and new member of the GSFLC, championed the grill, a thankless task on this sunny day with no cloud in sight. The softball tournament began with the Materials vs. Physical paths facing off. Materials advanced to play the Inorganic/ChemBio team, who won the second game, then played the Organic team. The final two games put Inorganic/ChemBio in first place, Materials in second, Physical in third, and Organic in fourth place. The Inorganic/ChemBio team will have one year of bragging rights and a poster of this winning team will be displayed in the Department of Chemistry’s Shain tower.